With the incorporation of the Baltic States into the Soviet Union in 1940, approximately 7.000 km (4.500 miles) of rail lines were added to the Soviet rail network. Of those 7.000 km (4.500 miles), approximately 2.900 km (1.900 miles) were wide gauge (1.524mm), 2.000 km (1.300 miles) were standard gauge (1.435mm) and 2.100 km (1.400 miles) were narrow gauge lines. Nearly all of the rail lines the Soviets inherited from the former Estonian, Latvian and Lithuanian railroad administrations were in excellent technical order; though very few were electrified. After the Soviet annexation, all of the railroad engines of the former Baltic States were re-identified with Cyrillic letters, though they were a direct translation of their Latin text equivalents. In addition to the military and political forces brought in to the Baltic States, the Soviets also imported a large number Soviet railroad engines and rolling stock into the Baltic States. Interestingly, the Soviets did not begin to convert the standard and narrow gauge lines in Estonia, Latvia, and Lithuania over to wide gauge until March of 1941. It need be remembered that many of the existing rail lines in the Baltics originated from the Czarist period, thus they remained in the wide gauge throughout the interwar period. This allowed the Soviets to use many of the main trunk lines in the Baltics with no difficulties. The Soviets placed their primary rail conversion efforts in Lithuania as well as in the former Vilnius territory plus eastern Poland - that is, they converted those rail lines first which was closest to the German-Soviet border regions. A number of mobiles, rail-based field artillery platforms were also brought in to Estonia and Latvia by the Soviets in 1940. Five known Soviet Army railroad artillery platforms were located in Estonia from 1940 to 1941; four 102mm mobile naval guns and one 152mm mobile naval gun. They, for the most part, were stationed near key Soviet military facilities on the Baltic Sea coast between Tallinn and Narva. Right after the German invasion of 1941, these units were in all likelihood withdrawn to Leningrad. They never engaged the enemy from Estonian soil. Towards the end of the war, a Soviet heavy railroad artillery unit with guns ranging from 180mm to 130mm in size helped to destroy German defensive positions in and around Klaipeda (Memel) in Lithuania as well as in Königsberg. Only Estonia and Latvia operated armored train "regiments" throughout the interwar period. Lithuania had disbanded (mothballed) her armored train units in 1935. The Estonian and Latvian armored trains, both the standard and wide gauge trains, fell intact into Soviet hands in July of 1940. Little is known of their fate since that time. The Latvian armored trains would have been of greater value to the Soviets as a few of the Latvian trains were truly armored trains in the traditional sense of the word. The Estonian armored trains were more a hodgepodge of assorted Czarist era "O" class engines, wagons and artillery platforms containing 102mm Canet type naval guns. The Estonian armored trains were either partially to semi-fully covered with armor plating. As soon as the Germans entered the Baltic States in June of 1941, all of the property belonging to the Soviet railroad administration was quickly seized by the German Military's Feldeisenbahndirektion der Deutschen Wehrmacht. Riga, in Latvia, was made the central administrative center of the Haupteisenbahdirektion Nord in "Ostland". It formed one administrative branch of the Prague-Warsaw Eisenbahndirektion. On 01 December 1942, the Baltic component of the Prague-Warsaw Eisenbahndirektion was renamed as the Reichsverkehrdirektion (RVD) Ostland. As of 01 December 1942, the RVD was placed under the jurisdiction of the GVD Ost. By 1944, the Germans had over 600 railroad engines in operation in the Baltic States. The RVD Ostland was dissolved in October of 1944 when the Germans evacuated Riga. The first section of wide gauge (1.524mm) rail lines to be converted to standard gauge (1.435mm) by the Germans in the Baltics was in Lithuania. It was the trunk rail line running from Vilnius in Lithuania to Daugavpils in Latvia. Because of the military priorities of Heeresgruppe Nord, an order was given which stated that all of the Lithuanian, Latvian and Estonian rail lines were to be converted to standard gauge by the fall of 1941. This goal was met, with one exception. The line running from the port city of Liepaja to Saldus to Selpils to Krustpils remained wide gauge until the spring of 1942. By the summer of 1942, all of the other primary wide gauge lines in Byelorussia and Ukraine were also converted to standard gauge. This cause the German wide gauge armored trains some problems in May and June of 1942 as they really had nowhere to go. For them, the German advances made during the summer of 1942 in the Ukraine and Russia were a welcome relief. Many of the railroad bridges destroyed in the early days of "Operation Barbarossa" in Estonia, Latvia, and Lithuania had to be repaired by the Germans, especially on the main trunk lines. That took extra time, but it was not an insurmountable problem for the Wehrmacht. At Narva, the Germans rebuilt the bridge over the Narva river by April of 1942 which the Soviets had destroyed in the previous fall. Throughout 1942, most of the remaining narrow gauge lines were also now converted to standard gauge (1.435mm) by the German military. Ironically, what the Baltic States could not realize in 20 years, the Germans completed in just a few months - the standardization all of the rail lines into one unified operating system. Naturally, for the Germans, it was a matter of dire necessity. The Germans also added a second track to increase the flow of traffic to many of the rail lines which had previously only been single track lines. The small Estonian military rail lines serving the fixed coastal artillery batteries near Tallinn and on Saaremaa island remained in their original, narrow gauge (700-800mm) configuration throughout the 1940's. This was because they served only local needs and thus, they were never really directly connected to any main lines. This also holds true for the few narrow gauge (600mm) military lines of Latvia; one such line was located just to the east of Riga. During the spring of 1942, the Germans created two military priority railway transportation corridors from Germany through the Baltic States to the front lines. One main line was to serve the military needs of Heeresgruppe Nord and the other line to serve the military needs of the northern elements of Heeresgruppe Mitte - the red line (rote Strecke) from East Prussia to Virbalis to Kaunus to Vilnius to Daugavpils to Rezekne to Pskov to Luga. From there it moved via various rail (Feldeisenbahn) and ground transportation modes to the Leningrad front. The green line (grüne Strecke) was the second mainline. It traveled from East Prussia (Tilsit) to Klaipeda (Memel) to Mitva (Mitau) to Riga to Valga/Valka; Also present were green line branch number one from Valka/Valka to Pskov to Dno and green line branch number two from Valga/Valka to Tartu (Dorpat) to Tapa (Taps) to Narva. Although the Germans re-established civilian rail traffic as soon as possible in the Baltic States, German military transportation trains always had priority over their civilian counterparts. Because the Baltics were considered safe rear areas by the Germans, the Baltic region could be used for authorized rest and recreation leaves by all military personnel. Despite the war, the civilian and military trains operating in the Baltics were able to maintain their planned schedules with a fair degree of reliability. The volume of military goods transported via rail through the Baltic States dropped significantly during the winter months when compared to the volume of goods transported during the summer months. This drop in the volume rate is in part attributable to the number of engines the Germans had available for use in the winter seasons. In general, German engines and rolling stocks were not accustomed to operating in temperatures of 35 degrees below zero for weeks or even months on end. Ex-Baltic State and Soviet engines contained excellent design features which accounted for cold weather operations, not to mention longer distances between coaling stations. The Germans thus encountered greater difficulties in maintaining their (German) engines operational during the winter season in the Baltics (and elsewhere on the eastern front). Below freezing temperatures for long periods of time are common in the Baltic States, but much rarer in Germany proper. Locally confiscated engines and rolling stocks, that is, those Estonian, Latvian, Lithuanian and German railroad stocks dating from the pre-war era and which had survived the first Soviet occupation period, were for the most part re-wheeled to standard gauge (1.435mm) by the Germans as quickly as possible. Indigenous Baltic locomotives were marked with big white letters indicating which Baltic home rail yard they belonged to (Wn - Wirballen (Virbalis in Lithuania); Sa - Riga, etc.). Engines and rolling stock which was brought in from Germany to supplement the existing capabilities were designated as belonging to the Deutsche Reichsbahn - Ost. For the most part, Baltic nationals who were employed with the railroad systems of the independent Baltic States and who survived the first Soviet occupation were retained by the German military until 1945. The Germans also transferred a number of ex-Baltic engines to Finland via sea in part to augment Finnish war losses. On such transfer took place on 26 October 1941, a second transfer on 01 November 1943. At the end of the war, the Soviets demanded that Finland return those engines, which she did. For "Barbarossa" three armored trains were assigned to Heeresgruppe Mitte - Panzerzug 6 (normal gauge (1.435mm) and home stationed in Insterburg) was assigned to the 18. Armee; Panzerzug 26 and Panzerzug 30 assigned to the 16. Armee. Both were wide gauge trains (1.524mm) and both were home stationed in Eydkau in East Prussia. Six additional armored trains were attached to Heeresgruppe Mitte and three additional armored trains were assigned to Heeresgruppe Süd. The following armored trains were utilized in the Baltic region during WWII: Panzerzug 3, Panzerzug 6, Panzerzug 26, Panzerzug 30, Panzerzug 51, Panzerzug 63, and Panzerzug 67. For nearly the entire war, Soviet partisan activity was not a problem for the Germans in the Baltics. 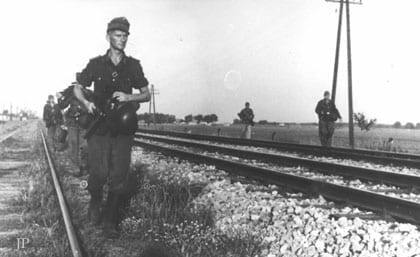 The few pro-Estonian, Latvian and Lithuanian partisans who remained underground past the German invasion also rarely interfered with German military trains. Doing so would disrupt the German war effort against the Soviets and that might hasten the return of communist rule. This was a situation all three Baltic pro-independence partisan groups wished to avoid under all circumstances. Pro-Soviet partisans formations did not become truly active in the Baltics until mid to late 1944. Between the fall of 1944 and May of 1945, the Soviets worked hard to reconvert many of the trunk lines they had just recaptured in the Baltics over to wide gauge. Their work was slow and difficult, for the retreating Germans were very thorough in destroying everything of military value they could. Over 40% of the Estonian rail lines were made inoperative by the retreating Germans.